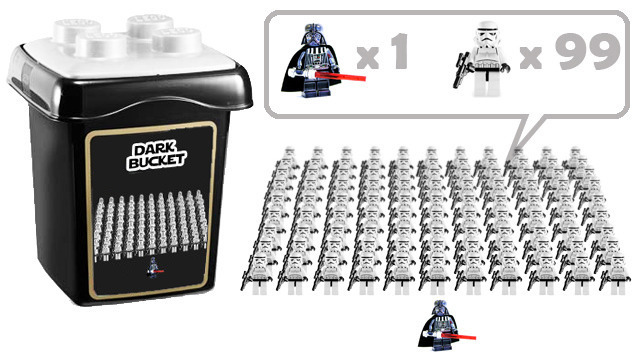 Recently, on Lego’s crowd sourcing initiative, Lego Cuusoo, a submitter came up with an excellent suggestion – a bucket containing 99 Stormtrooper MiniFigs and a single Darth Vader MiniFig. This would be ideal for the collector who is looking to build a Lego army. I’d speculate that many would like to reproduce the “Imperial Inspection” scene from Return of the Jedi. Sadly, for reasons tendered, due to licensing conditions it is not possible. It is sad when something as stupid as licensing prevents the production of something like this. It’s almost certainly only at the detriment of the fans – you’d think that any agreement between Lego and LucasArts would omit MiniFigs from the “Action Figure” classification.